The phrase “The Experience Economy”, like the worst sort of corporate speak, sounds less like a viable business plan than it does a discarded slogan for Las Vegas. Still, that was the explanation for SAP’s $8 billion acquisition for Qualtrics just days before the latter was set to IPO. Personally, I quite prefer the phrase “Experience Management”; it places this move by SAP very much in line with the enterprise software provider’s history. SAP was founded in 1972 by five former IBM employees, who a year later launched an accounting system called RF; the ‘R’, which would christen all of SAP’s products for decades, stood for “real-time.” The idea was that, by leveraging databases, companies could get a “real-time” view of the state of their company. Three years later the company launched a purchasing, inventory management, and invoice verification system called RM. Over the ensuing years more and more modules would be developed to cover more and more back office functions; in 1990 Gartner christened the term ERP — Enterprise Resource Planning — to describe integrated software systems that managed nearly all of a company’s assets, allowing for, yes, “real-time” reports on how the company was operating. It makes sense that this is where enterprise computing really took hold: the logistics of managing large multinational companies were daunting, the exact sort of challenge at which computers were particularly adept. And, conveniently enough, those large enterprises had the capability to pay for what were expensive, time-consuming, and error-prone software installations and ongoing maintenance. That these systems were almost completely internally focused makes sense as well: there was no Internet, which meant data had to be entered manually in a centralized location. Computers certainly made tedious bookkeeping much easier, but there were physical limits to just how much of the business could be managed. By the 1990s the world was rapidly changing: the PC revolution and corporate intranets led to computers on every desk, dramatically increasing the utility and efficiency of ERP systems. Just as importantly, the emergence of the Internet made it increasingly possible to connect to centralized systems from locations other than the main office. The category of software that symbolized this shift, and which defined that decade of enterprise computing, was CRM: Customer Relationship Management software. CRMs allowed companies to manage outside relationships: not just who contacts were, but also the entire history of interactions with those contacts. This was in many respects a more complex job than ERP systems simply because there were so many more inputs, specifically global sales forces which actually interacted with customers. Thanks to the combination of PCs and the Internet, though, far-flung sales representatives could now input data from all over the world into a centralized piece of software that, like ERP, gave management a much more fine-grained view into how the business was actually operating. The big difference, though, is that while ERP gave a view into “what” was happening, CRM showed “who” it was happening with. Fast forward another 20 years and the world has dramatically shifted yet again: not only are computing devices and Internet access ubiquitous, but critically, that ubiquity is not confined to businesses: customers, the ultimate endpoint of any business, are today just as connected as the employees of any large enterprise. This can be a rather frightening proposition for large businesses: look no further than social media, where seemingly every week some terrible story about a company with poor customer service goes viral; there are an untold number of similar sob stories shared instantly with friends and family. At the same time, competition is dramatically higher as well; customer choices used to be constrained by geography and limited channels for advertising: you could choose one mass-market product from conglomerate X, or a strikingly similar product from conglomerate Y. Today, though, you can find multiple products from any number of vendors, some large and many more small, the latter of which are particularly adept at using channels like Facebook to reach specific niches that were never well-served by large enterprises designed to serve everyone. These shifts, though, afford an opportunity, which is exactly why SAP bought Qualtrics. Founded in 2002 with the goal of solving the most complex problems encountered by the most advanced academic researchers, we were forged in an environment that required rigorous analytical methods, ease of use, the versatility to address the broadest range of inquiries, and the scalability to reach millions of touch points globally. Our leading presence with academic institutions has introduced millions of students to Qualtrics and allowed them to become proficient in the use of our software. As these students have migrated into the workplace, they have often brought us with them, spawning a whole new class of commercial customers and developing new use cases for our XM Platform. Still, at first glance it seems kind of amazing that some survey software would be worth $8 billion! In fact, it’s not: after all, Survey Monkey IPO’d a couple of months ago, and is worth $1.3 billion. What makes Qualtrics different is what comes after the survey: a much more extensive toolbox of data analysis and reports that, at least in theory, give actionable insights into what exactly consumers think about a product or their interaction with a company. What makes this possible is the paradigm shift I just described: consumers are always connected, which means reaching them is dramatically cheaper than it used to be. Even seemingly basic channels like email are very effective at driving surveys that show exactly how consumers are feeling immediately after interacting with a company or buying their product. This gives an entirely new level of insight to management: while ERP showed what was happening in the main office, and CRM what was happening in offices all over the world, experience management promises the ability to understand what is happening with customers directly. It is a perfect example of businesses using new technology and paradigms to their advantage. Still, experience management — which, the last few paragraphs notwithstanding, is still glorified surveys — has limited utility. When an ERP system shows a problem, it is very clear who is responsible, and what needs to be done to fix it; the situation is the same with CRM. What makes experience management into an actual tool of management is tying customer feedback to specific moments in time, whether those be customer service interactions or specific transactions. To win in the experience economy there are two pieces to the puzzle. SAP has the first one: operational data, or what we call O-data, from the systems that run companies. Our applications portfolio is end-to-end, from demand chain to supply chain. The second piece of the puzzle is owned by Qualtrics. Experience data, or, X-data. This is actual feedback in real-time from actual people. How they’re engaging with a company’s brand. Are they satisfied with the customer experience that was offered. Is the product doing what they expected? What do they feel about the direction of their employer? Think of it this way: the O-data tells you what happened, the X-data tells you why it happened. At present, there is not technology company that brings these two worlds together. In particular, this exposes the structural weaknesses of CRM offerings, which are still back-office focused. Experience management is about helping every person outside of companies influence every person inside a company. So SAP and Qualtrics will do just that: the strategic value of this announcement is rivaled only by the business value. That business value is very much predicated on SAP’s nearly fifty year history: the real potential of this deal is tying data from consumers about their experience to actual transaction data, whether that be a purchase or a customer service interaction. In SAP’s vision, managers can react not simply to events after they show up on the balance sheet, but ideally before they, well, don’t: a constant refrain on the investors call was the important of limiting churn, which makes perfect sense. It is far more expensive to acquire a new customer than it is to retain an old one, and the combination of Qualtrics and SAP, uniquely enabled by the state of technology today, gives businesses an opportunity to do just that. 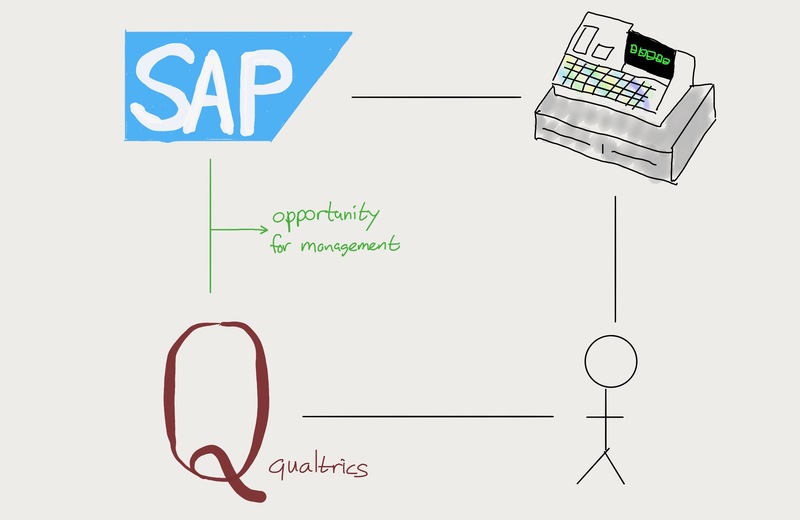 The potential of the SAP + Qualtrics tie-up holds a lesson for businesses of all types: while it is always easy to see how the Internet screws up existing business models, it also presents completely new opportunities. Businesses that succeed will see the Internet as an opportunity; those that fail will frame it as the bogeyman in their demise. It is to SAP’s credit that they have embraced the former, and now it is on their customers to do the same.